Rick Fridell and Local 126 member Cotton Collins were on hand to fight back against an attempt to pass a right-to-work law in Sussex County, Del., on Jan. 9. The IBEW and other unions scored a win in Delaware on Jan. 9, when the GOP-dominated Sussex County Council voted 4-1 against a proposed right-to-work law. 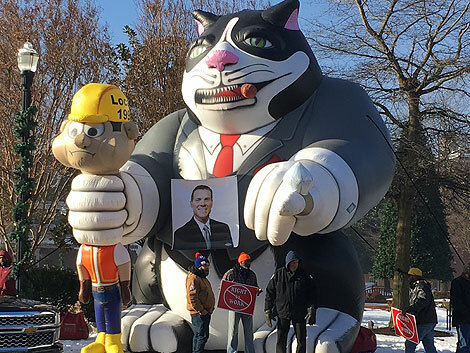 An inflatable fat cat holds a picture of Sussex County, Del., council member Rob Arlett before the council voted down a proposed right-to-work law on Jan. 9. Arlett, who was the only one of the five council members to vote in favor, was President Trump’s campaign manager in Delaware in 2016. It’s unclear if the proposed ordinance could have been enforced. Delaware does not have a statewide right-to-work law and attorney general Matt Denn said a county ordinance would violate state statutes. The county council’s own lawyer urged members not to pass the ordinance, saying the county would incur significant legal fees in a court battle it likely would lose. Still, the vote is a victory for working families in Delaware, which has been a Democratic stronghold but has seen support for right-to-work laws grow, especially in the politically conservative southern half of the state. Delaware is the second-smallest state in the country and has just three counties, so a county-wide right-to-work law likely would have a larger impact than in most states. It’s also just one battleground in working families’ fight against conservative attempts to pass right-to-work laws across the country – and even at the federal level. In Ohio, two legislators have introduced state constitutional amendments to implement a right-to-work law there, even though voters resoundingly voted down such an effort six years ago. There were reminders during the vote in Sussex County that Delaware’s fight is far from over. Some members said they were voting against the measure because of the anticipated legal costs, volunteering that they will work with legislators to enact a right-to-work law statewide. Notably, even council president Michael Vincent said no businesses had told him they would relocate to Sussex County if the ordinance had passed. Right-to-work laws allow employees to opt out of paying union membership dues, even when they enjoy the benefits of a union contract. They undercut wages and benefits for both union and nonunion workers, studies show. Democrats have controlled the state House, Senate and governor’s office in Delaware for more than 20 years, but Murrian cautioned not to read much into that, noting the state’s loose banking regulations and the fact it is one of five states without a sales tax. Even Democrats often bow to corporate interests because of that. That was evident when the Republican minority introduced legislation on Jan. 9 to weaken the state’s prevailing wage law. Some observers think it has a chance to pass as part of a budget compromise. Prevailing wage laws set wages and working conditions before contractors can bid on a publicly-funded project. The election of President Trump emboldened right-to-work advocates, including groups affiliated with the American Legislative Exchange Council, which writes sample legislation for state governments that harms working families, Fridell said. Rob Arlett, the lone council member to vote for the ordinance, was Trump’s campaign chairman in Delaware. “All we have to do is lose a couple of elections and this could be a right-to-work state,” said Fridell, who works out of Local 126’s office in Bridgeville, Del. The five county council members are all Republicans. They were expected to vote on the proposed law during a Jan. 2 meeting, but right-to-work opponents packed the meeting room and drew a large rally outside. The vote was pushed back one week, when it ultimately failed. IBEW members and other unions again turned out in force. Fridell noted that Local 126 is at full employment, so members attending took vacation time or other leave to attend. Some Local 126 members in Sussex County are volunteer firemen, he said. Many attended a fire department community event the weekend before the vote wearing their IBEW shirts. Right-to-work has been a hot-button issue across America in recent years. Last year, the GOP-controlled New Hampshire Legislature refused to pass a right-to-work law. Voters in Missouri used a petition drive to force a statewide vote on a right-to-work law passed by the Republican-dominated legislature and signed by GOP Gov. Eric Greitens. The law is not being enforced, pending this November’s election results. And the battles go on. In Ohio, legislators also introduced amendments to seriously weaken or do away with prevailing wage laws and project labor agreements. PLAs help ensure fair wages for workers and give local contractors and businesses a better chance to bid successfully on the work. They also help keep more tax dollars in local communities and provided a higher-skilled work force, including IBEW members.